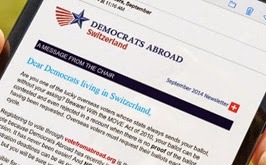 One of the main activities of Democrats Abroad is helping Americans exercise their right to vote. At the Expat Expo fairs we are there to make sure Americans recently arrived in Switzerland know how to register to vote from abroad and answer questions about getting your absentee ballot and more. Lucerne Expat Expo, Sunday November 6th at Museum of Transport, 11am-5pm. Come out and meet our new DA Zurich Chapter leadership: Renee Rousseau and Ashley Wheeler! They're looking forward to meeting DA members and friends living in the Luzern area. Did you know that election laws have changed? Due to the MOVE Act passed in 2009, Americans living abroad must request an absentee ballot EVERY year of an election. Even if you registered for an absentee ballot in past elections, you are obligated to register again in 2012 and request your ballot. Come January 2012, we'll be working hard to make sure all Americans in Switzerland register to vote and request their ballot for November 2012 Election. Want to help? Be part of the 2012 campaign! email: chair@democrats.ch to volunteer.